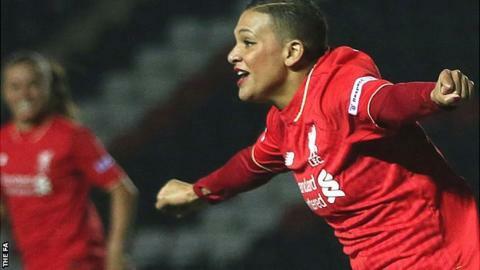 Shanice Van De Sanden's first goal in English football helped Liverpool Ladies win with 10 players as Birmingham City missed two penalties. Siobhan Chamberlain saved a fourth-minute spot-kick from Kirsty Linnett after Sophie Ingle handled. Van De Sanden then beat Blues keeper Sophie Baggaley to a cross-field ball and bundled in the game's only goal. Mandy van den Berg saw red for bringing down Melissa Lawley in the 70th minute, but Freda Ayisi missed from the spot. Chamberlain then saved twice from Linnett late on as Liverpool held on for three points. Liverpool Ladies: Chamberlain; Harris, Bonner, Van den Berg, Greenwood; Ingle, Longhurst, Zelem (Coombs 80); Van de Sanden, Lundh (Weir 75), Harding (White 90). Substitutes not used: Gibbons, Pacheco, Hodson, Green. Birmingham City Ladies: Baggaley; Windell (Westwood 63), Mannion (Wellings 75), Harrop, Sargeant, Carter; Peplow (Haines 83), Potter, Lawley; Ayisi, Linnett. Substitutes not used: Johnson, Stringer, Schofield, Edwards.